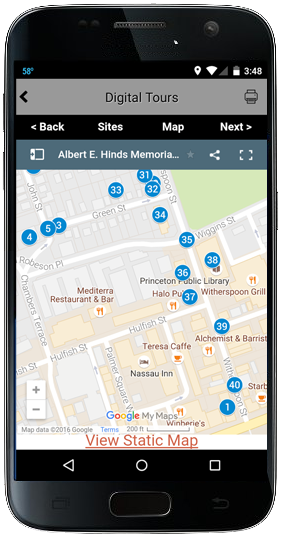 Experience the Historical Society of Princeton’s signature local history walking tours digitally – anytime, anywhere! Explore some of Princeton’s most notable, and more hidden, places, with the help of an audio guide and unique material from HSP’s extensive collections. Stay up to date on HSP’s exciting events and exhibitions and get important visitor information in the palm of your hand. Download it for free from the iTunes store or Google Play store. Don’t have a smart phone? Click here to access the web-based version of the Albert E. Hinds Memorial Walking Tour: African American Life in Princeton.